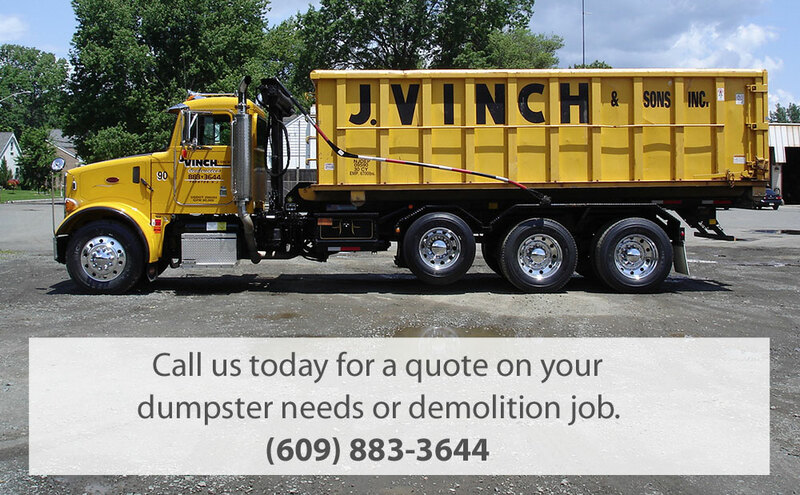 J. Vinch & Sons is your local company for competitively priced dumpster rentals, garbage removal, concrete recycling, and building demolition services in Mercer County. Italian immigrant Giuseppe De Vinci began his trucking and excavating company in 1912. As his business grew and years passed his sons joined him in the firm which is now called J. Vinch & Sons, Inc. Since the passing of Giuseppe, his sons took over the company, and as time marched on the youngest of the sons, Charles Vinch took over the business. At present Charles's four sons, Joe, Charles, Sam, and Gary, plus one of his three daughters Rose, form the team that runs the company today. They are hands on, working in the office and in the field and are ready to take on your projects. Call them today for a custom quote on your project.